28/1/13 - Acquisitions - Douai, Musée de la Chartreuse - An oncologist, Philippe Denis assembled an extensive collection of paintings by Eugène Carrière which he wished to donate to a museum. Thanks to the counsel of Etienne Bréton and Corinne Hershkovitch (a lawyer who recently helped in recovering a painting by Jules Breton - see news item of 16/8/11, in French), the Musée de la Chartreuse in Douai was chosen as it already owns three works by the artist, two of which are from the collection of the Doaui painter, Henri Duhem, himself the donor of an important Symbolist and Pointilliste holding. 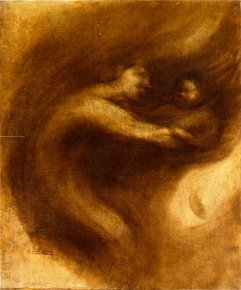 The donated paintings, dating or datable from between 1875 and 1904, are representative of Eugène Carrière’s artistic production. They all appear in Rodolphe Rapetti’s catalogue raisonné. 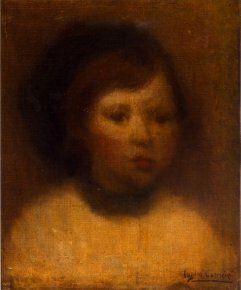 A Portrait of a Child in Alsatian Costume (ill. 1), painted on wood, can be dated between 1875/1880. The Alsatian costume is possibly an evocation of patriotic sentiment after the loss of the region a few years earlier. This painting, as does the following one dating from 1877 showing a child in the countryside seated next to a parasol (ill. 2), reveals a color palette recalling (especially in the second of these two panels) that of the Impressionists which the artist soon abandoned, favoring rather almost exclusively brown shades in a vapory manner, eliciting the following comment from Degas (in a slightly mean but humorous manner) : "someone was smoking in the children’s bedroom". 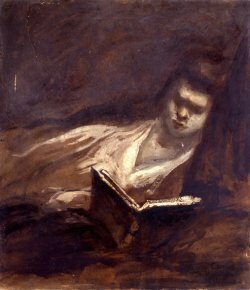 These varying shades of brown can also be found in a painting representing a young woman reading (ill. 3), a frequent subject for the painter, signed and dated Eugène Carrière/ à Rouveyre/ 1882 which seems surprising as they were used a bit later. This work, with a recurring theme, may therefore have been backdated by the artist but in fact executed in 1887-1888 . Reading, 1882 or 1887-1888 ? Several portraits in the donation, dating from the 1880’s, are thus painted in this very characteristic manner. These include a canvas entitled Woman with Red Flower representing Mrs. Carrière (ill. 4), as well as the next one which is however entitled Melancholy (ill. 5) due to the way the artist’s wife is represented in a pensive mode. This work was presented at his first personal exhibition at the Boussod and Valadon Gallery in April-May 1891. 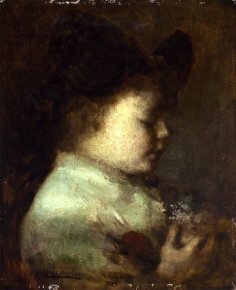 Eugène Carrière’s first child is depicted in another portrait (ill. 6) with an original technique (hard to detect on the photograph) : "the canvas has a very smooth aspect, with an almost ’porcelain’ effect and the depth of the look is rendered by scratching the canvas with the brush handle." A group portrait, Woman and Child around a Table (ill. 7), rounds out this series of works devoted to the artist’s family and painted in the second half of the 1880’s and early 1890’s. Other works can be considered as corresponding to portraits but the models have not been identified and, like others quoted above, they could just as easily be accepted as Symbolist figures. However, this is probably less the case for Seated Woman with Bracelet (ill. 8) or Woman’s Profile (ill. 9) rather than the feminine figure entitled Imploring (ill. 10) which Rodolphe Rapetti associates with "unfinished" works by Auguste Rodin and Medardo Rosso. The preceding paintings date from the late 1890’s. A bit later, Motherhood (ill. 11) with its serpentine forms reveals an Art Nouveau influence on Carrière. Another scene in this donation also shows a mother and child (ill. 12) while a study for a painting representing Lucienne Bréval (ill. 13) was produced later than the family portraits mentioned above. The donation concludes with a landscape depicting a view of a field in Magny-les-Hameaux where Eugène Carrière and his family often stayed in the summer at the house of Raymond Bonheur (1856-1934), a composer (and also Rosa Bonheur’s nephew). The theme, of course, recalls Claude Monet but is treated in an entirely different manner. Magny. The Haystack, c. 1901 ? The ensemble includes another six paintings considered at the time to be by Eugène Carrière but not included in Rodolphe Rapetti’s catalogue raisonné. These are in fact pastiches or copies after the manner of Eugène Carrière with some bearing the studio’s stamp (or a fake stamp perhaps). They were kept in the donation since they reflect, in their own way, the artist’s popularity and a certain moment in the history of taste. We reproduce them below with no further comment (ill. 15 to 20). The donation is being presented at the Musée de la Chartreuse until 4 March 2013 before a portion joins the permanent collection on view there. All of this information comes from the study of these paintings by Rodolphe Rapetti and Alice Bourgoin-Lamarre.